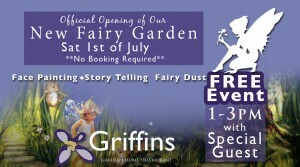 We have all been waiting for Griffins to open their new fairy garden and trail and finally The Fairy Council of Ireland have confirmed that the garden will be officially to the public (human and fairy) on Saturday July 1st, with an official opening from 1pm to 3pm. Don’t miss the opportunity to meet the special guest, explore the new fairy trail and enjoy complimentary fairy face painting and story telling. This is a free event and no booking is required. Griffins of Dripsey, where magic is created. !